Hi! Welcome to the Crazy Crafters Blog Hop, with special guest… ME! The Crazy Crafters are Kylie Bertucci’s Stampin’ Up! team. What an honor to hop with this amazingly talented team again! A huge thank you to Kylie for asking me! For the blog hop, everyone is CASEing one of my cards (Copy and Selectively Edit). I can’t wait to see which cards the Crazy Crafters chose to CASE and what they do with them! Make sure you hop all the way around back to me so you can see all of the beautiful projects the Crazy Crafters make. This is the card I chose to CASE for the blog hop. You can see the details on how I made the card here. The details I kept from this card for my new card are the same stamp set and dies (Happiness Surrounds stamps and Snowfall Thinlits dies, which are part of the Snowflake Showcase, which is NOW AVAILABLE to customers until November 30th, while supplies last) and the watercolor emboss resist technique. Isn’t it amazing that you can get two completely different looks from this stamp set? 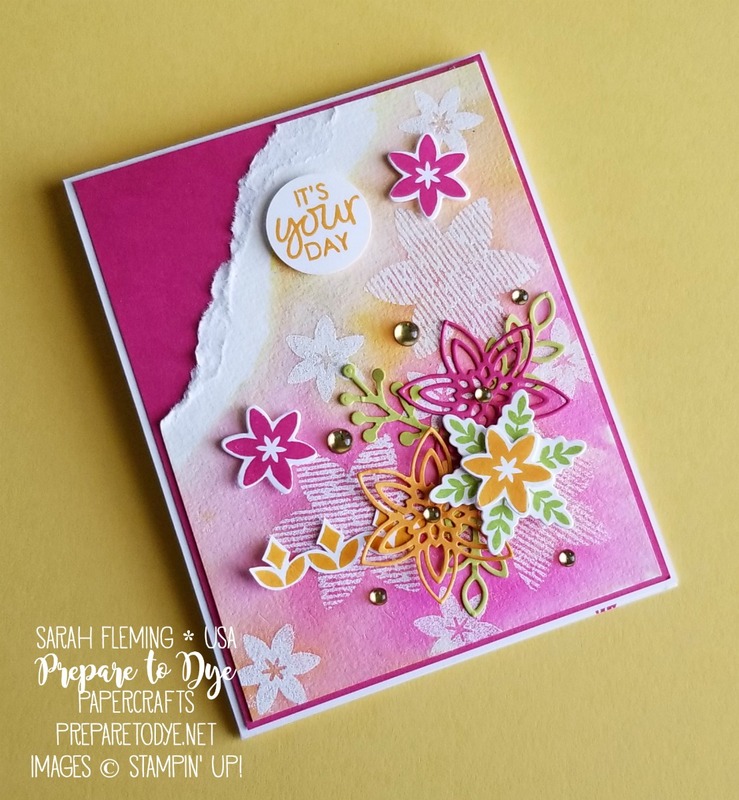 The card I’m CASEing uses fall colors for a fall floral card, and I went the opposite direction here and came out with a very springy card. The dies are also the same Snowfall dies I’ve been using to make all the gorgeous snowflakes! I started the card with a piece of watercolor paper, 4″ x 5-1/4″. I stamped all of the flowers in Versamark, then heat embossed them with White embossing powder and the Heat Tool. Then I wet down (liberally) a diagonal area starting at the bottom of the card with my Aqua Painter. I smooshed Melon Mambo, Mango Melody, and Daffodil Delight inks onto clear blocks and used the blocks to grab color from. I added all three colors to various parts of the wet paper. 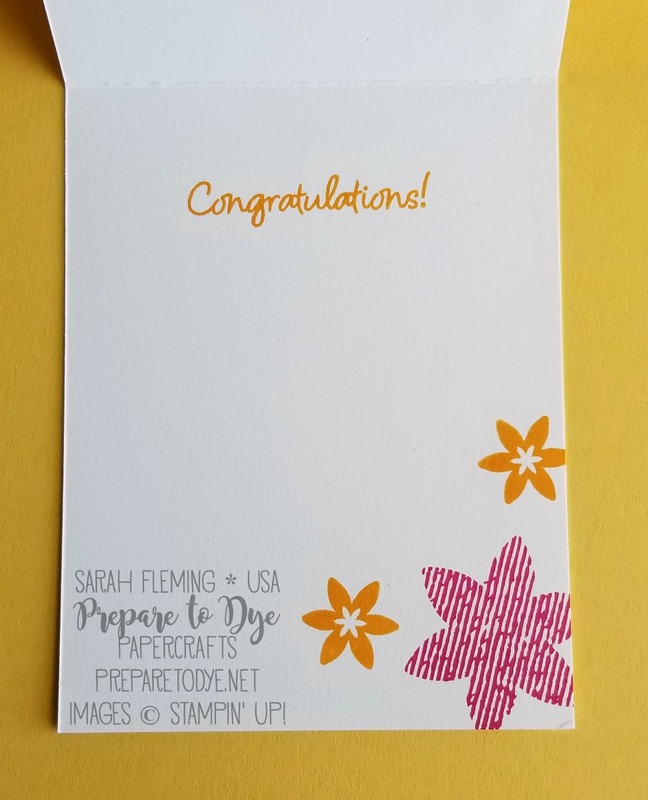 While the background dried, I stamped and die cut several flowers in the same ink and cardstock colors, plus Lemon-Lime Twist. All of these dies are in the Snowfall Thinlits, and the one I used to cut out the leaves behind the focal point flower also cuts out a snowflake from the Snow Is Glistening stamp set! I fussy cut the chain of Mango Melody flowers on the lower left side. After the background was dry, I sponged Champagne Mist Shimmer Paint all over the background, very lightly. Just enough for a little shimmer. 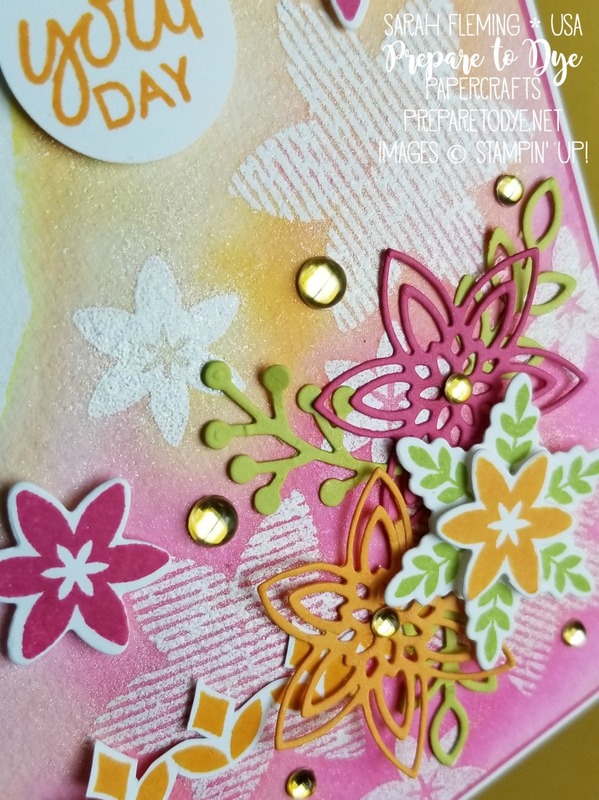 I added all the flowers and leaves to the paper using Multipurpose Liquid Glue and Mini Dimensionals, then added some clear Epoxy Droplets, which I colored with the Dark Mango Melody Stampin’ Blends marker. 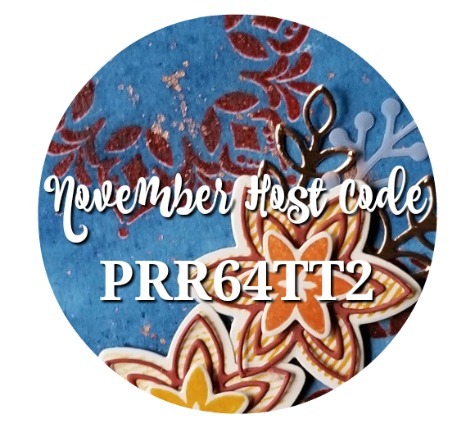 I stamped the sentiment in Mango Melody and punched it out with the 1″ Circle punch. I tore the top left corner off of the watercolor paper, since I hadn’t used it anyway and I’d rather have pink space than white space. I mounted the watercolor paper on a 4-1/8″ x 5-3/8″ piece of Melon Mambo cardstock, then mounted everything on a Whisper White card base (4-1/4″ x 11″, scored at 5-1/2″). I couldn’t leave the inside naked! I stamped some more flowers and a sentiment on the inside. Thanks for stopping by today! And thanks so much to Kylie for inviting me to be part of this wonderful blog hop. Make sure you follow the hop all the way around to where you started. You’ll see lots of fantastic projects! 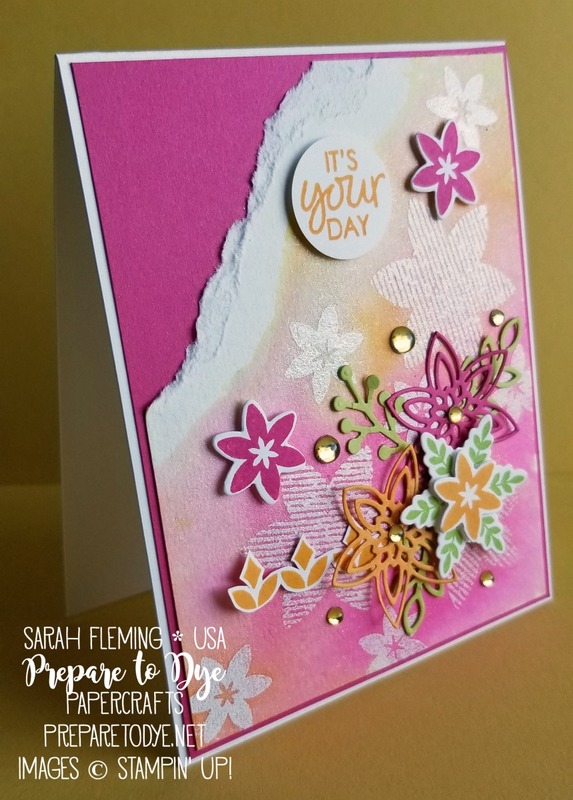 Stunning card Sarah, Thank you for letting us case your projects. 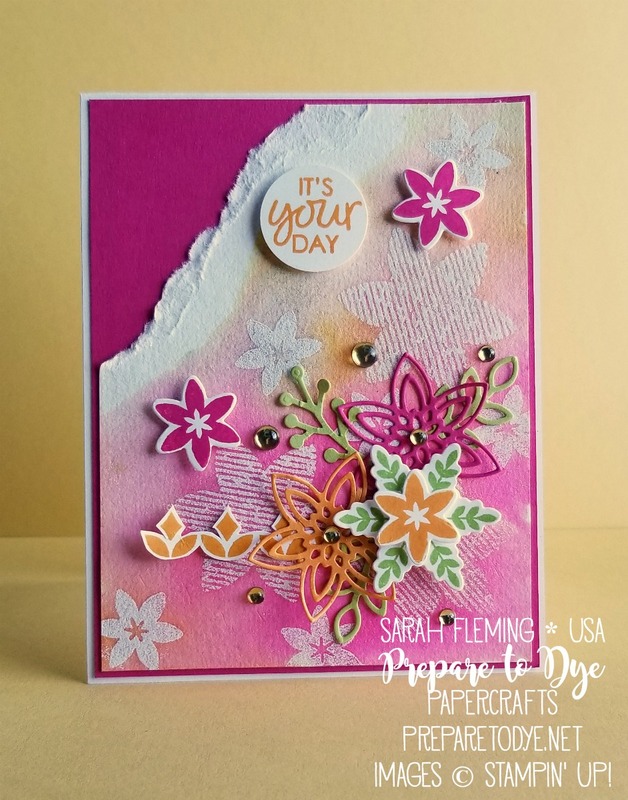 Beautiful pink card Sarah! Love the watercolored background! Love your gorgeous design. The colours are amazing. Thank you for joining us today. Super stunning cards Sarah, thank you for hoping with us today! Oh what a gorgeous card! Love those colours!